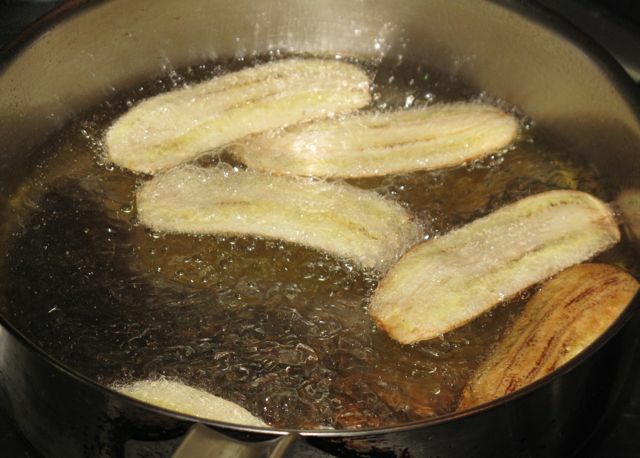 …the cook heated up some oil and fried the bananas until just lightly golden and removed them to drain on some paper towels. The next problem was how to make them sweet. I tried making a simple syrup of sugar and water and dipped the fried bananas in this mixture… Unfortunately, this resulted in too thick of a sugary coating and the chip had a tendency to get soft over time. I made a lighter suga/water mixture and lightly brushed it onto the chips and this resulted in a nice lightly sweetened banana chip. I suspect its best to bake these chips for a while to set the sugar and make sure they remain crisp… Or maybe the chips are sprayed with the sugary water before they are fried… who knows? What I do when I cook banana chips, I sun dried the unripe banana and then while deep frying it, I sprinkled just a little amount of brown sugar to make it sweet. Sun drying the unripe banana will lessen also the absorption of oil, so it will not be too oily and that will make your banana chips crunchy. 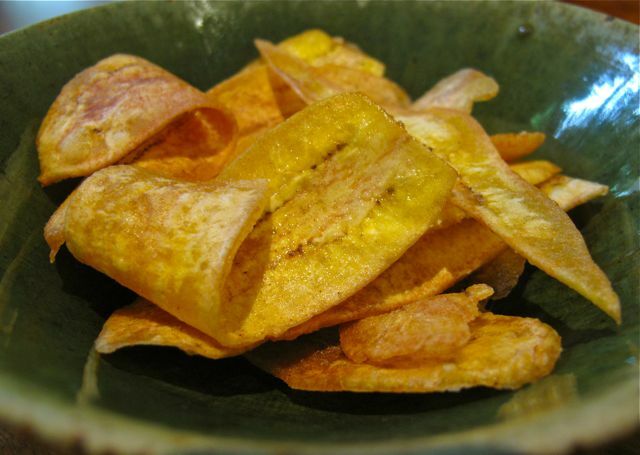 The best ever banana chips I’ve tasted are those being sold at Crisostomo restaurant at Resorts World. Super thinly sliced and very lightly sugared that they’re almost translucent. Maybe the slices are coated with sugar first and left to macerate for a while, then drained and left to sundry. Maybe doing this process 2 or 3 times and each time the drained syrup is boiled to killl any undesirables, cooled down and added to the bananas. Drain and sundry again. After the final sundrying, then it is oven baked or deep fried. I guess this experiment will have to wait till we get really how weather for at least 1 week in a row!!! Maybe the packaged ones have some sort of chemical anti-humidity agent to keep them crisp. One thing about the home-made ones is at least you know they’re chemical-free. Just eat them quickly! Love the fact you show all the different stages with some great photos to make it easy to follow. Yum! I might have missed it haha, but why is it attributed to Ailyn, MM? Just curious! 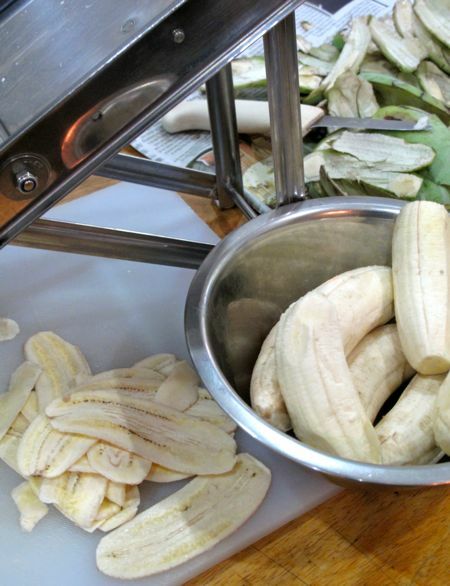 I prefer my to fry my banana chips using almost ripe saba bananas so that i don’t have to bother with putting sugar. It’s more healthier but still deliciously crispy… yum! Michelle’s banana chips are available at asian stores in our area and it is pretty good. Thin and crunchy, the level of sweetness is fine for me. Very addicting after the first bag we bought last week, we ended up going back to get 3 more bags. Definitely the best one I have ever tasted. 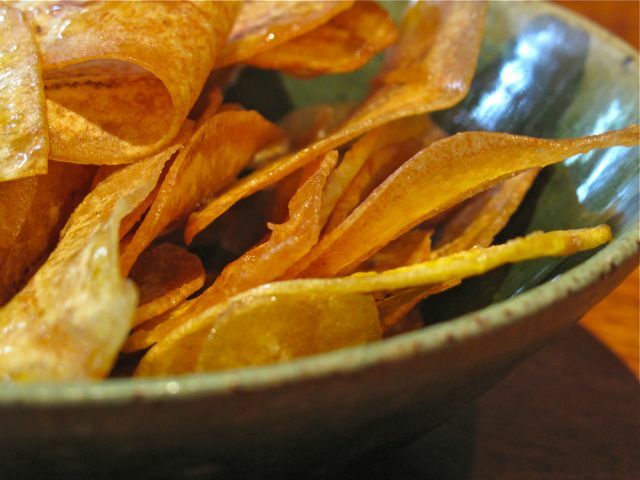 I so want to try making those chips now. 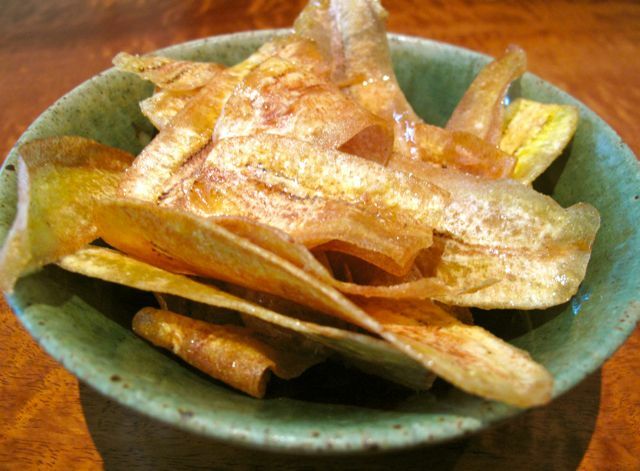 Here’s a simple recipe for homemade banana chips: Just sprinkle the thinly sliced green bananas with sugar and a little salt and deep fry until golden brown. Drain and let cool. Store in sealed containers ( i keep mine in bottles). You have to make them in batches though, as the sugar turns watery if you let it sit before cooking.